Yesterday (December 14) Alaska Airlines announced the purchase of Virgin America. So far the language the airlines are using is a lot about partnership and “joining forces”. This is a departure from other acquisitions, such as the recent takeover of US Airways by American. Officially Alaska has purchased Virgin America. My guess is that at some point Alaska will phase out the Virgin America name. But it seems that they have heard from their customers and are preserving the brand for now while the determine the best path forward. I was invited to attend the Alaska Airlines + Virgin America Press Conference at San Francisco International Airport’s Terminal 2. The day started at Alaska’s corporate headquarters where we were bused to the Alaska hanger at Seatac for the revealing of the special “More to Love” livery. 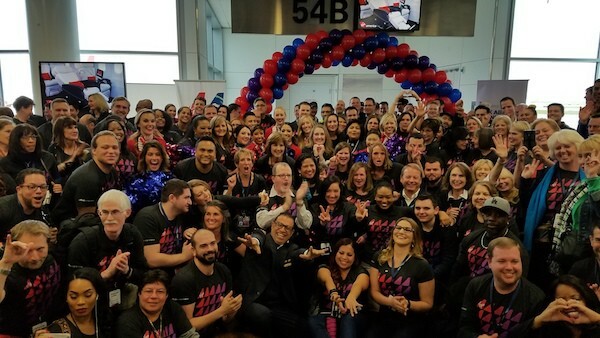 The charter flight then took the group of media and Alaska/Virgin employees to SFO where we were greeted for the Alaska Airlines + Virgin America Press Conference at gate 54B. Various officials spoke; including Alaska Airlines chairman and CEO Brad Tilden, San Fransisco Mayor Ed Lee, SFO Director Ivar Satero, Alaska EVP/Chief Commercial Officer Andrew Harrison, Alaska Airlines President and new CEO of Virgin America Ben Minicucci. No decision yet on what to do with the diversified fleet. Alaska only flies Boeing, Virgin America only flies Airbus. Approximately 300 positions at Virgin America will be cut, mostly in back office. The hope is to actually hire more front line employees. For now the Virgin America brand name will live on, but for how long and in what fashion is to be determined. Expect a single operating certificate in January 2018. You can read my posts about the future of loyalty programs at the two airlines and the new branding campaign.